Lately I have a strong feeling that the Chinese must be rejoicing at all the “retroactive law invention” that is going on in the West to put one man in jail. 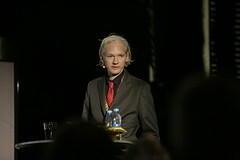 Because if Assange had been a Chinese citizen promoting transparency in China we would be lining up to give him the Nobel Prize. We can’t demand transparency from others and censorship for ourselves. If the US government did not want its secrets known, all they had to do was to encrypt these secrets as Wikileak’s Assange is doing with this file. As CNN argues it comes with an encryption that not one of all the encryption crackers in the world can figure out. Think about it, we will all have this file but we will not be able to read it. Can’t the US government do the same if something is really a secret? How can real secrets be distributed among over a million of people with easy access to matters way beyond their jurisdiction and unencrypted? From now on, if you want a secret, encrypt it, and make it a crime to break the encryption.